Modern luxury hotels and resorts line the island of Djerba and a large number of tourists are attracted here every year. This city is located on one of the remote islands in Tunisia, along the Gulf of Gabes. The island serves as a link among several totally different cultures. The rest of the great continent of Africa lies to the south and Europe lies across the Mediterranean Sea to the north. Guellala is the highest point and has a pretty outdoor museum with a row of re-created traditional homes. It presents the old livelihood activities (agriculture, fishing, weaving etc.) from Djerba so people can better understand life on the island before the arrival of mass tourism. The overall presentation is modern and educational. Djerba is rich with cultural attractions, oases, palm groves, and picturesque villages that can take you on a magical journey with unforgettable memories. Djerba is highly recommended for anyone who wants to discover Tunisia at his or her own pace and with an adventurous spirit. Because it is located along the southern latitude of Tunisia, Djerba's atmosphere is generally gentle. All year round, the weather is warm but not humid. July and August are the summer months and the ideal time to visit. It is during the summer when normal highs are in the upper 90s, and lows are in the 70s range. The coldest months are December through February, when normal highs are in the 60s, and lows down to the 50s. There are few cloudy days, and there will practically never be two days in succession when the sun is not sparkling. A downpour occurs periodically, with a normal of 62 days out of the year demonstrating some precipitation, generally in the winter season. Summers don’t have any overcast clouds nor a hint of rain and are basically dry. Throughout the summer season, rates for everything from flights to hotel rooms are priced much higher because of the peak season for tourism in Djerba. If you consider going during the winter season, you might be able to find better deals and discounted tour packages. The Musee du Patrimoine Traditionnel Djerbien presents a nice overview of the local traditions in Tunisia, from the feast of betrothal / marriage to everyday life. It is well structured and each room is numbered to make it easy to follow a logical progression of traditions. The exhibition includes diverse objects and a glimpse into the life of being a Berber here in Djerba during the ancient times. It is a suitable place to take both children and the elderly. This museum is the best way to spend a lovely afternoon and learn the historical importance of the island. Outside, you can see camels. At the entrance a guide who has a degree in Mediterranean Anthropology will greet you. 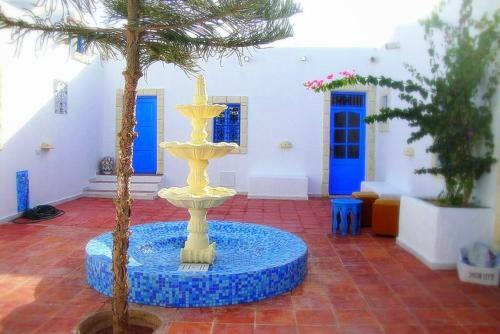 The reconstruction of a typical Djerba house is neat, well maintained and spacious. To represent the different moments of the life and traditions of the people, there are almost life-size statues dressed in traditional costumes (parties, weddings, etc.). The different objects from everyday life are shown here as well as the handicraft talent of the locals. Artifacts ranging from the ordinary up to the extremely rare are displayed along with the statues. There are very interesting message boards that enclose ancient costumes, textiles and ornamental objects. It is ideal to visit the Krokodilfarm Animalia on Wednesdays and Saturdays to see the actual feeding of the crocodiles. It is interesting to watch how the workers feed the crocodiles while the audience huddles in disbelief and fear. Sometimes they bob their noses trying to catch a piece of chicken, and you hear a crackle as they finish it all up, then the employee scatters them around with a shovel. The best time to go is at 5:30 when they are most active -- if you go early, you will only see a lot of sleeping crocodiles. The highlight of the trip to the farm is to hold a small crocodile in your hand and take photos. This facility for crocodiles and turtles is very interesting and provides good information. It is an extensive complex with an attached museum dedicated to the animals that you can visit. Take a journey into the origins of Tunisia with a visit to the Guellala Museum. The museum focuses on the arts and traditions of the country. Located on beautiful grounds with wonderful flowering plants, it has a dazzling white architectural structure -- and with the blue sky as a background it looks amazing during the day. In this museum you will learn many interesting facts about family life, preparing for a wedding, circumcision of infants, and how the early Tunisian Berbers worked. You can see camels outside plowing the wheat, and there is a row of typical houses. The tour is well organized and has a great view over the entire city. There are numerous shops selling locally made crafts and the unique insignias from around the world. In addition to the museum there is a special area where masterpieces in ceramics are crafted by skilled artisans of Djerba. The museum also houses musical instruments, jewelry (Berber and Bedouin), old books and glazed ceramics (bowls and plates traditionally used at weddings or holidays). The Fort Ghazi Mustapha (Borj El-Kebir) is something halfway between an archaeological site and a ruined fort. The island of Djerba is not just hotels and resorts -- especially if you venture inland, you will find the old traditions and the things from the past. This fort is not even inland, it is next to the marina and offers unique landscapes facing the sea. Although not yet fully restored, its labyrinthine paths, towers, ruins, and statues will fascinate you. Ghazi Mustapha built the fort in the 16th century as a gateway arch and to protect the town of Homt Souk. The historic fort is also close to the city bazaar and market center. There is an amphitheater in the fort where you can take panoramic photos of the ocean and the city. It is good to explore and learn every bit of history with a guide as you wander around the old ruins with their broken statues. The imposing structure is very simple, but the best parts are the ramparts, where the view is superb. Even the inside areas are very interesting, making this fort one of the places not to be missed when in Djerba. Djerba is a Muslim city, but the Jewish influence is still prevalent and its historical importance is obvious at this synagogue. If you enter the synagogue, you must take your shoes off, and wear long clothes and headscarves. The synagogue itself is beautiful with the blue colors -- and definitely worth it especially if you have not been to any synagogues before. Jewish pilgrims study the scriptures at the El Ghriba Synagogue every weekend. The country’s Jewish community has been a part of Tunisian life for many centuries. It is small but steeped in religious history. The temple is home to one of the oldest Torahs in existence, which is celebrated during an annual pilgrimage (drawing international participation) every May. The blue-tiled synagogue is a place full of stories and distinguished by its colorful decoration. A Jewish guide answers your questions and gives full information about this place. It succeeds in showing the peaceful co-existence of the Jewish and Muslim religion, a fine example to all. The armed guards who secure the area are very cordial and you can enter the synagogue without any problem. The L’Eglise Saint Joseph is one of the oldest churches in the Maltese community; it was closed for quite a long time, then occupied by various secular activities, and has now been restored and rehabilitated for a while. The exterior is not bad but the interior is much more interesting. This is a very simple church that well deserves having its decorative elements selected by Djerba Heritage: among these, the use of kilims and mosaics was especially noted. The church is very solemn, an ideal place for contemplation and meditation. The Church of St. Joseph is a small church. It is interesting to see the decorations and paintings, stained glass, and religious sculptures. It has a varied collection of icons within view of the visitors. These small works of sacred art contain an amazing diversity of influences, with both artistic and religious symbolism. The priest is very nice and open to discussion. The Holy Masses are offered in different languages every Saturday and Sunday at 10:00 AM. Discover the predominantly sandy (but rich in flora and fauna) seabed of Djerba with the trained professional divers of the Blue Dolphin Djerba Dive Center. You can have a great time and see two shipwrecks lying in the ocean with this company's well-prepared and organized expeditions. For those who need diving equipment, they have all the most recent gear and gadgets for hire. The diving center is located on the beach and is run by very helpful staff. There are fabulous backdrops with wrecks to view. The dive leads to the site where most tropical fish and octopus converge. Plan your diving adventure in the summer season for better visibility of the marine wildlife in the waters of Djerba. Houmt Souk's Old Town is the best site to enjoy a fascinating walk and to feel the multifaceted and enterprising nature of Djerba. Featuring an exotic maze of rugged alleyways lined with picturesque whitewashed properties, shopkeepers advertising their vibrant ceramics from every corner, and handicrafts of every sort -- this souk will definitely be the place you can take care of your shopping! You can choose from conventional handicrafts, intricate handmade jewelry, ceramics, clothing, prayer rugs, carpets, leather shoes and boots, brass and cutlery, leather merchandise, and endless rows of pottery -- at least. If you want to go fishing, there are boats with colorful designs for rent at the fishing harbor of this small village. This place is not only lined with small hotels, there are fine dining areas and cafes to choose from in case you are famished. Be sure not to miss the camel parade and the cultural shows that are held every night, they are very entertaining. Djerba's most in-demand beachfront attraction is the Plage Sidi Maharès. It is a wonderful place to unwind and take it easy after shopping and wandering around the souks. It is one of the oldest beaches and equipped with the most complete infrastructure of a well-patronized coastal attraction. The resort operators in this area have the sandy beach neatly lined with beach loungers, small huts, and umbrellas for rent. The cafes and a great selection of restaurants can also be found strategically located along its 8-mile length, as well as shower rooms and toilets for every guest’s convenience. An ancient lighthouse at the far end of the beach entices guests to climb its tower to have a great view of the Gulf of Gabes and the island of Djerba. This fascinating small art gallery built in the 18th century is situated in the city and became famous because of its stalactite-inspired ceiling design. The Musée des Arts et Traditions Populaires holds the largest collection of the classic and traditional costumes in Tunisia. If you are curious about the cultural history of this country, this place will provide many answers and evidence of the nation’s ethnic and traditional past. A special room is dedicated to the Islamic faith and features a collection of Old Quran’s and Islamic prayer beads. The exhibit rooms offer more variety and many items that can only be seen here in this art museum. The old jewelry, colorful ceramic collections, and the classic wedding gowns on display are all popular with visitors. All of the creative work is properly recognized and acknowledged; every item includes the name of the painter, designer, or sculptor. This museum of the arts is truly an amazing and informative place to learn about the customs of the country. It is unusually authentic and a must-see when on the island of Djerba.